A good kitchen tool can make the cooking process more convenient. A great kitchen tool saves time and money. It makes the cooking process easier, more fun and less messy. And if it’s a really great kitchen tool, it becomes something a cook can’t live without. I’m kicking off a new feature today: Tools of the Kitchen. Each month, I’ll profile a kitchen tool or gadget, provide links to recipes, information on use & cleaning, and let you know where you buy it. I’ve amassed quite a collection of kitchen tools over the last few years, from the overpriced and nearly-useless (a food chopper) to the extraordinarily simple and absolutely necessary (a wooden citrus ream). The goal of these pieces is to share my experiences using products that are practical, functional, and economical. It seemed appropriate to start this year with a feature on the cast iron skillet, a tool any home cook can use year-round in kitchens large and small, on the stove top and in the oven, for dishes savory and sweet. As I’ve just begun to learn, this is an extremely versatile tool—you can sauté vegetables, fry chicken, bake cornbread or a giant chocolate chip cookie. And you can make restaurant-style steak at home, which is exactly what I did with my 12″ skillet on Sunday. 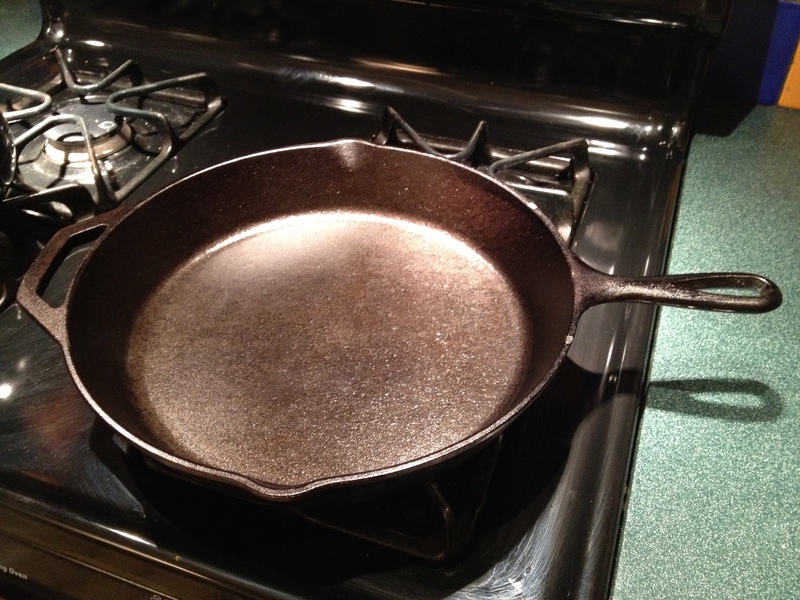 The big mystery of cast iron cookware: What the hell does ‘seasoning’ mean? Making your pan non-stick without the use of chemicals, and it’s really easy. There are a number of suggestions out there (of course there, it’s the Internet), but perhaps the simplest way to season your skillet is to do the following: Coat the pan with cooking oil and put in a 350 degree oven for one hour. Allow it to cool enough to handle, and dry with a paper towel. Congratulations—you have just created a non-stick pan. Even better, you’ll reinforce the nonstick coating every time you heat oil in the skillet. Never touch any part of a heated cast iron pan with your bare hands. Always use oven mitts or dish towels. Avoid boiling water in cast iron. It could lead to rusting. If you’re finding food sticks to the pan when you cook it, it’s time for a seasoning. Cleaning instructions are below, but always remember: do not put cast iron in the dishwasher. Always make sure the pan is thoroughly dry before putting it away. This is not a pan you want to air dry on the dish rack. I invited my father and my boyfriend to watch the Giants/Falcons game on Sunday, and while I took care of preparing cheesy mashed potatoes and mushrooms, my dad brought me four glistening filet mignon steaks to cook in the 12″ skillet he got me for Christmas. Taking a cue from Ina Garten, I made steak restaurant-style: seared on the stove, and finished in the oven. That was a wise decision. What wasn’t so wise was leaving my phone out of reach, so I don’t have pictures of the beautiful steaks I made. [Sad face]. Not only did the steaks look like they were cooked by a professional chef, they were perfectly tender and covered with a beautifully seared, crisp and tasty crust. Magic, indeed. Making stove-to-oven steak in a cast iron pan is a virtually goof-proof method—but as I learned quickly, it is absolutely essential that you heat the pan long enough, keep an eye on the clock, and have a good pair of oven mitts on deck. Otherwise you could end up with burned meat or worse, burned hands. Cleaning a cast iron skillet is also a snap, but here’s some more essential info I learned: don’t use soap, and don’t soak. A cast iron pan will stay hot for awhile after you’ve removed it from heat, so once it’s cool enough to handle, rinse it with hot water and use a brush to scrub off any bits still sticking to the surface. Dry immediately. To keep your pan looking shiny-shiny, dip a piece of paper towel in vegetable oil and rub it over the surface of the pan, blotting any excess, before storing. Nesting other pans atop this one isn’t recommended, but if you need the storage space I’d suggest putting a clean dish towel on your cast iron skillet before putting anything else on top of it. Or you could call it weird science: cast iron cookware does transfer some amount of iron into food as you cook it (so if you’re anemic, this is the pan for you!) It is said that making tomato sauce in a cast iron pan will darken the color of the sauce, also thanks to iron. 12″ cast iron skillets are widely available in department, kitchen supply and hardware stores nationwide, and while I am usually an advocate for buying locally, you’ll find the best deals online. Both Target and Amazon carry Lodge’s 12″ pre-seasoned skillet for under 30 beans. I hope this post has been helpful, whether you already have a cast iron skillet or have considered adding one to your kitchen. In case I’ve left anything out, please post any questions or comments. This will be really helpful to me in future Tools of the Kitchen posts as well. Thanks! This entry was posted in Tools & Gadgets and tagged care, cast iron, cast iron recipes, cleaning, cookware, kitchen equipment, maintenance, pan, skillet, tools. Bookmark the permalink.